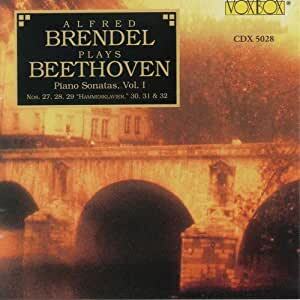 BEETHOVEN:Piano Sonatas, Vol. 3: Nos. 1/5/6/9/10/13/14 "Moonlight"/15 "Pastoral"
A.B. impresses me with his clarity, precision and rhythmic steadiness. Wonderful stuff! To me, his Hammerklavier conveys a remarkable sense of a man who comprehends the mood and intent of the piece. A.B. has a sure hand and a real passion - stronger for being understated. He's putting across a more Mozartian lightness here, but it works. Beautiful Beethoven! Loved it despite few rushed passages. 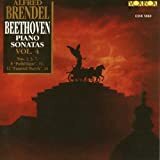 I have all 3 volumes in this cycle of Beethoven Sonatas recorded in the early 60's by Brendel. 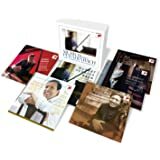 They are truly an exceptional value as each package contains 2 discs worth of music. The sound is very good overall and the performances are masterful. This particular volume offers Beethoven's late Sonata's along with the tour-de-force Hammerklavier. The riches unfold with each hearing and the performances of all these great works is at a very high level. A great purchase! A different approach by Brendel then the set by Serkin. 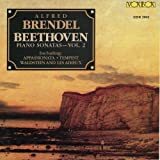 Brendel plays every note perfectly and although a little stiff captures the Beethoven mood perfectly. I own both the Serkin and Brendel sets and play both equally. Perfect music. I owned these performances on the Vox LPs over 40 years ago. I highly enjoyed them then and they are still quite enjoyable. If you can afford three budget sets those by Claude Franke, Wilhelm Kempff, and this set are a nice place to start. 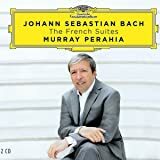 (I would suggest in that order) The complete sonatas can be obtained for about $40.00 All three performers are incredible in their very different interpretive styles. There are certainly many fulled price sets that are not as enjoyable as these sets. For Brendel fans you may want to consider the 35 disc set on Brilliant. 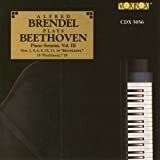 It contains recordings made by Brendel for Vox AND Vanguard including music by multiple composers including the complete Beethoven sonatas. The CDs cost less than $2.00 a piece which is a great deal. I have not listened to this Brilliant set but one Amazon reviewer reports better improved sound quality. If you are an audiophile you may want to purchase other recordings but I find these particular Vox CDs very listenable.